Halloween specials on the TV and watching others donning absurdly creative outfits. I'm loving reading the spooky beauty tutorials on my Bloglovin at the moment! 1 and 2. Oscar in costume - This little pumpkin top from Primark is so sweet! It was £2.30, treated by his grandparents, along with his nan homeknitted toggle cardie: I love all the autumnal colours in the wool! We chose a size 12 months+ so it can fit him for 2 years in a row, he has been watching me carve pumpkins and gourds this evening and getting excited! 3. Fairytale tree - This beautiful tree is growing down near the back of the fell lane; it looks so haunting with its gnarled roots curling over the stone wall. It looks like the perfect nest for faery-kind to live or a hiding place from out of the Lord of the Rings. 4. Bath and Bodyworks marshmallow pumpkin latte - The smell reminds me so much of lattes - and also marshmallows and caramel! It smells divine, the perfect autumn scent, I just want to eat it! I love the new design of their hand sanitisers! This one was £1.99 from ebay with free postage. The listings run out so fast but I have found this one that still has some of the gorgeous autumn and winter scents left - grab them quick! 5. Pre Raphaelites and Flowers board - My favourite thing is curling up in the evenings and pinning things, making little themed collections. It's definitely my favourite social media tool: if there's anywhere I would choose to escape to it would be the vast, blush coloured, glittery lands of Pinterest. 6. Fluffy cushion from Primark - I adore picking up little bits and bobs of winter decor here and there; pillows and fleecy throws. I've seen these pretty pink and white heart cushions many times on tumblr pictures and the like, so was overjoyed to find them in Primark at only £3 each! 7. Krispy Kreme pumpkin doughnut - I absolutely love how they bring out different seasonal varieties of doughnuts, it took a lot to tear me away from my beloved Raspberry Glaze but I'm so glad it did this once. 8. Autumn leaves - My favourite thing about autumn, I would love to save and press a few copper leaves as keepsakes. They look so lovely preserved and kept in old books, as bookmarks; I'd love to collect a few skeleton leaves too as they are so hauntingly beautiful! 9. Sass and Belle tribal suitcases - I chose these for extra storage so I could free up more room for Oscar's growing clothes compilation. The tribal patterns and cute motifs such as 'Be Brave' are so sweet, as well as the woodland animals and they will be perfect for keeping his keepsakes and books in later on - or on a shelf in a little boys' room. They are a really lovely size! I'd been pouring over their floral suitcases for months so I was so excited when they brought out a little tribal range too. They fit in to each other like little russian dolls! There is currently a competition running to win all the pieces from the Tribal Adventure Collection - link here. Will you be entering? What are you up to this Halloween? Have a wonderful weekend Elizabeth! 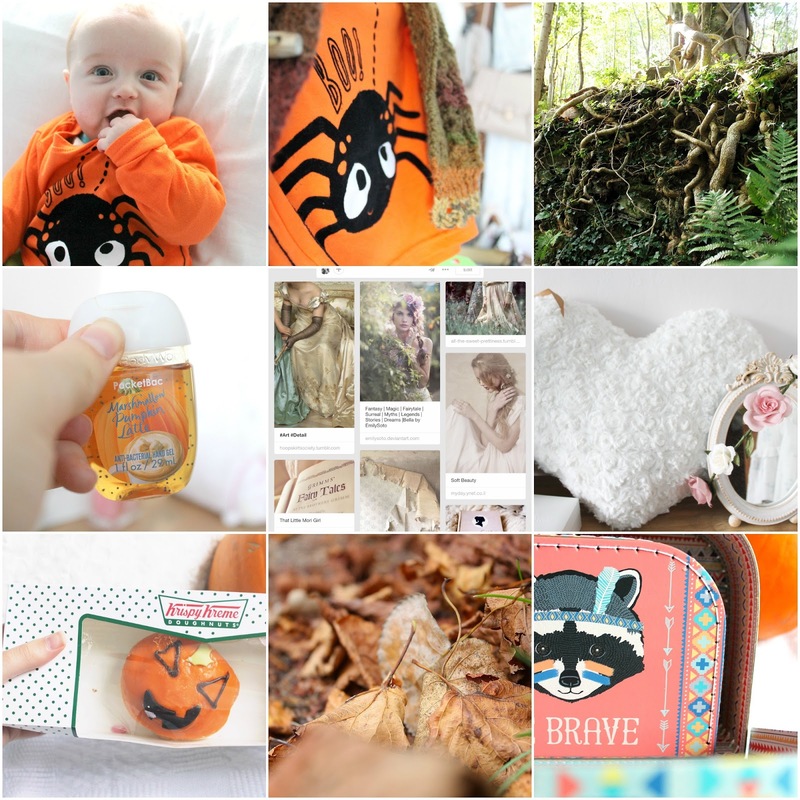 Such a cosy and great post - thank you! Oscar's costume is so cute! I just love everything about this post! Oscar's costume is just too adorable for words! I wish there was a Primark in the states, because everything looks too cute <3 I'll definitely be entering that contest---here I come super cute suit case~ Heh heh wish me luck! Oscar so cute in his costume! Love photos as always. Happy Halloween Elizabeth! Lovely photos, I love Oscar's little outfit, so cute!